Joan Miro 1893-1983. Spanish painter, whose surrealist works, with their subject matter drawn from the realm of memory and imaginative fantasy, are some of the most original of the 20th century. Miro was born April 20, 1893, in Barcelona and studied at the Barcelona School of Fine Arts and the Academia Gali. His work before 1920 shows wide-ranging influences, including the bright colors of the Fauves, the broken forms of cubism, and the powerful, flat two-dimensionality of Catalan folk art and Romanesque church frescoes of his native Spain. He moved to Paris in 1920, where, under the influence of surrealist poets and writers, he evolved his mature style. 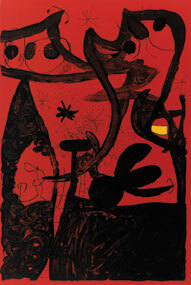 Miro drew on memory, fantasy, and the irrational to create works of art that are visual analogues of surrealist poetry. These dreamlike visions, such as Harlequin's Carnival or Dutch Interior, often have a whimsical or humorous quality, containing images of playfully distorted animal forms, twisted organic shapes, and odd geometric constructions. The forms of his paintings are organized against flat neutral backgrounds and are painted in a limited range of bright colors, especially blue, red, yellow, green, and black. Amorphous amoebic shapes alternate with sharply drawn lines, spots, and curlicues, all positioned on the canvas with seeming nonchalance. Miro later produced highly generalized, ethereal works in which his organic forms and figures are reduced to abstract spots, lines, and bursts of colors. Miro also experimented in a wide array of other media, devoting himself to etchings and lithographs for several years in the 1950s and also working in watercolor, pastel, collage, and paint on copper and masonite. His ceramic sculptures are especially notable, in particular his two large ceramic murals for the UNESCO building in Paris (Wall of the Moon and Wall of the Sun, 1957-59). 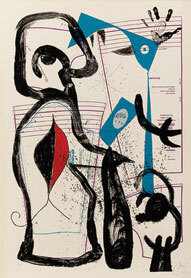 Miro died in Majorca, Spain, on December 25, 1983.